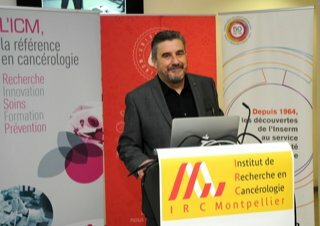 «In just 20 years, the Institut de Recherche en Cancérologie de Montpellier (IRCM U1194) has raised its research to the highest international level in the field of fundamental and applied oncology, research carried out in close collaboration with the clinical departments of the Centre de Lutte Contre le Cancer de Montpellier (ICM: Institut du Cancer de Montpellier), and industrial partners. Jointly operated by Inserm, ICM and the University of Montpellier, the IRCM now brings together more than 200 people, researchers, clinicians, technicians and students, organised into 17 research teams supported by efficient technical platforms and support services. In an extremely competitive and rapidly evolving field of research, our greatest challenge is to stay one step ahead, seek excellence, accelerate innovation and transfer to the patient to ultimately help overcome the countless different forms of cancer.